For September in my circle in do. 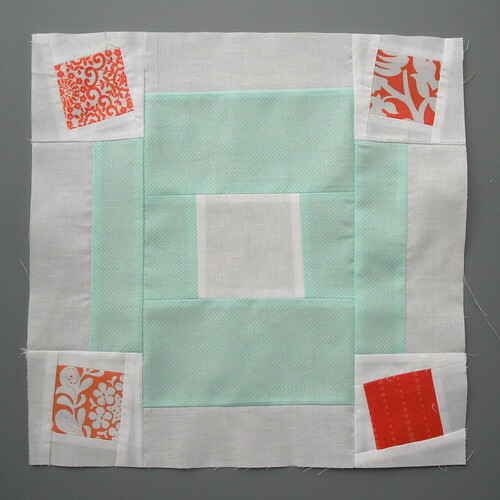 Good Stitches, we were asked to make two Jumble blocks in aqua and orange. Pretty cute, no? These are going to make an awesome quilt! July's task for my circle in do. Good Stitches was to make two ET Phone Home blocks using deep reds, bright icy blues, and grey for the background. 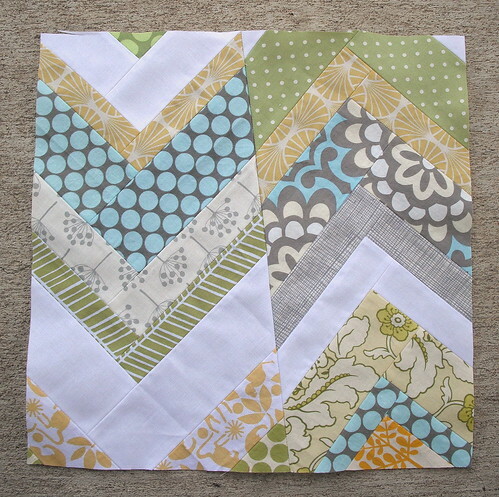 This was my first real block using paper piecing, and it turns out it's much easier than it looks! I'm pretty happy with how my blocks turned out. It took a lot of time, but the end result is pretty stunning! Last month in my circle in do. Good Stitches I got to make some improv chevron blocks using the tutorial over at Six White Horses. We were requested to use white, light grey, yellow, green and blue/aqua, all in light, soft shades. It was a little harder than I expected finding these colors in my scrap bins since I tend to lean toward bright colors, but with a few cuts from my yardage stash, I had plenty of prints to pull from. I'm a little sad at how straight the pieces ended up being. I guess that's part of improv sewing. And when you think about it, if it truly is random, you're just as likely to end up with some straighter lines as you are super crooked lines, so I can't be too disappointed. 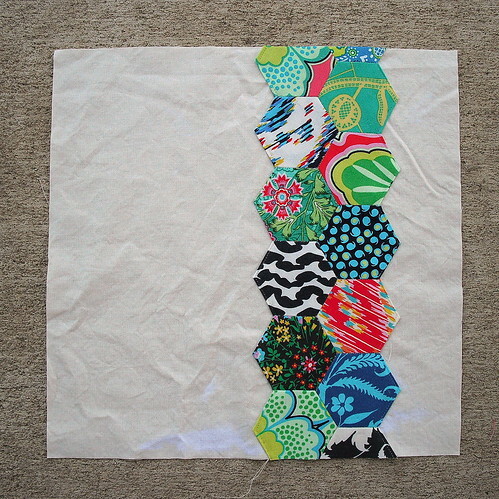 I think this quilt is going to end up pretty cool! 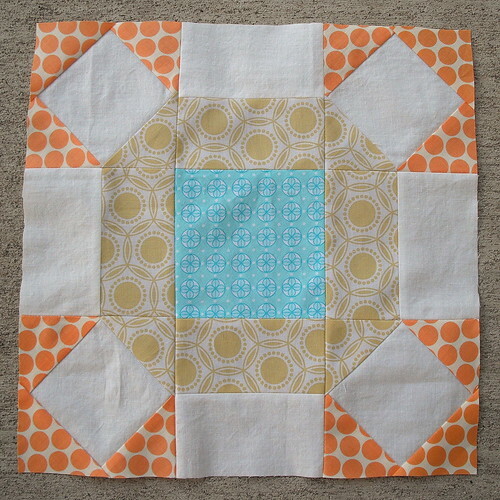 Our May blocks for my circle in do. Good Stitches was the Rolling Stone block in orange, yellow, lime/apple green, aqua/teal, and white. These were really fun to make, and I had a lot of these colors in my scrap bin. I pretty much squealed when I found the print in the middle of this second block. It had all the right colors built in, so I knew I had to use it! 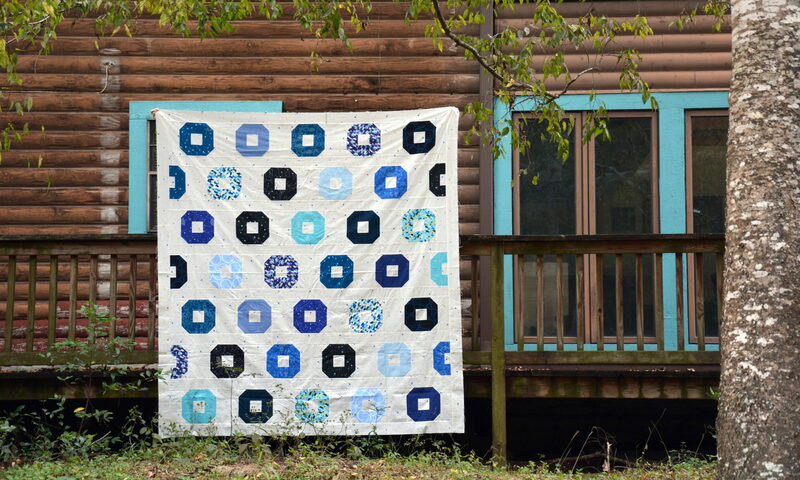 I can't wait to see how this quilt turns out. I got my blocks of the month done early this month! Woohoo! Here's what I've been working on. 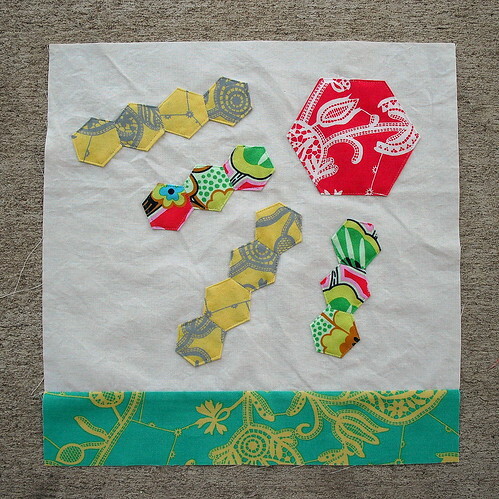 First up, the Craftsy block of the month used English paper piecing. I started on some hexagons a while ago, but I haven't gotten far enough to learn the entire process, so I was very excited to finally learn how to put it all together. It's actually a lot easier than it looks. 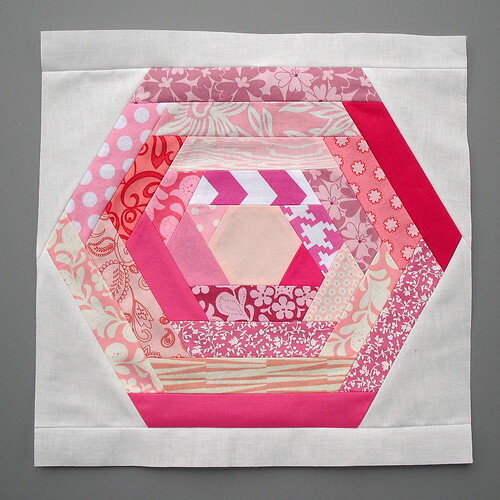 One of my favorite parts was breaking out some invisible thread for machine appliqueing the hexagons to the fabric. This was my first time to use it, and I can definitely say that I'll do it again! 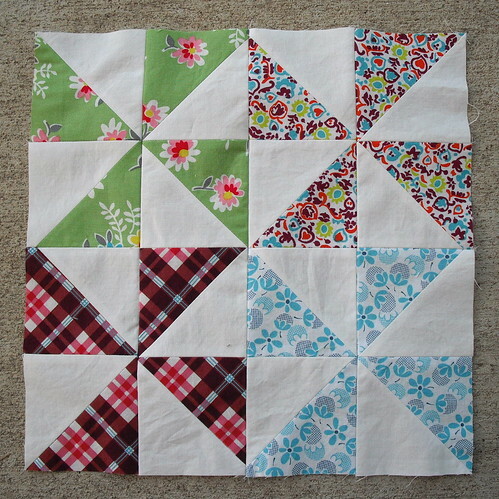 Next up, the HST block of the month - pinwheels! 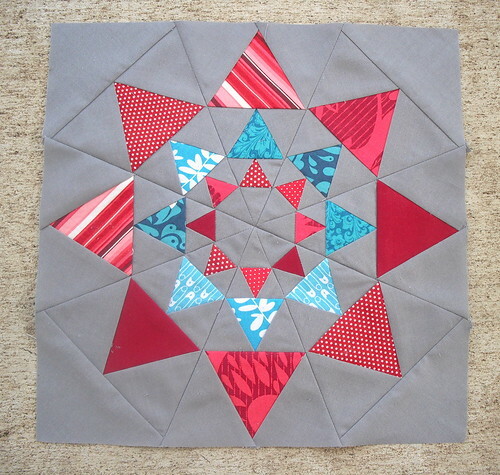 Seriously, who doesn't love pinwheels? I can never get enough of these! Lastly, some Hexing Around blocks for my circle in do. Good Stitches. These certainly weren't quick to put together, but I'm really loving how they turned out. 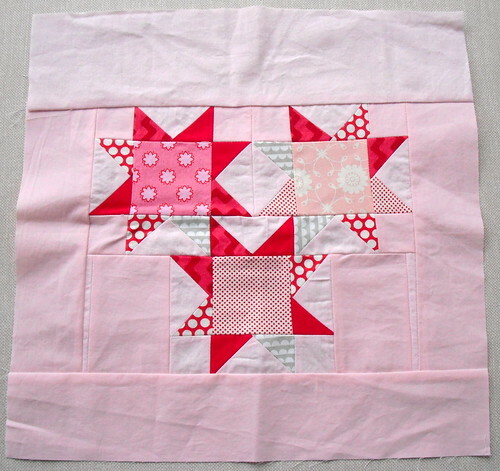 My color was pink, so I got to pull a bunch of scraps left over from my string quilt to get these done. Now if I could just finish my April cottage, I'll be ready for May! 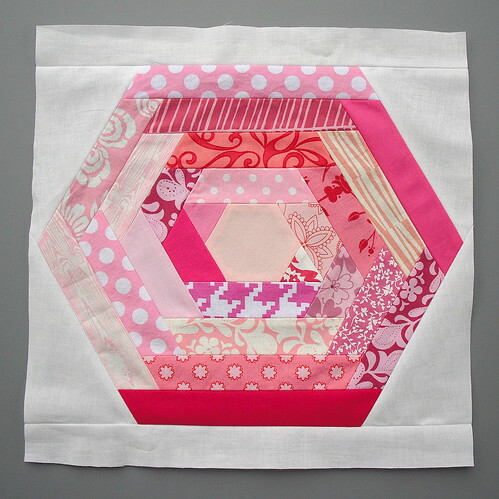 One of my sewing goals for 2012 is to participate in a quilting bee. I signed up for the charity bee do. Good Stitches at the end of last year, and I was accepted into the Imagine circle which happens to be run by the lovely Amanda. 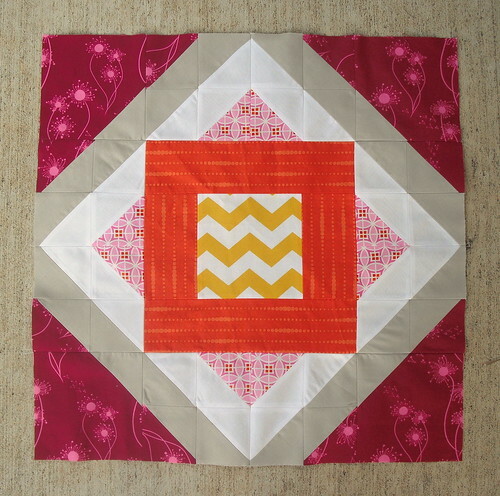 Our circle will be donating our quilts to Threading Hope! 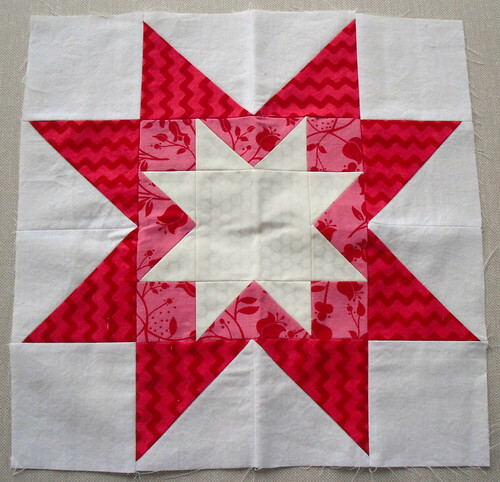 Our first month's blocks are sawtooth stars made from red, pink, white, and a little bit of accent gray. 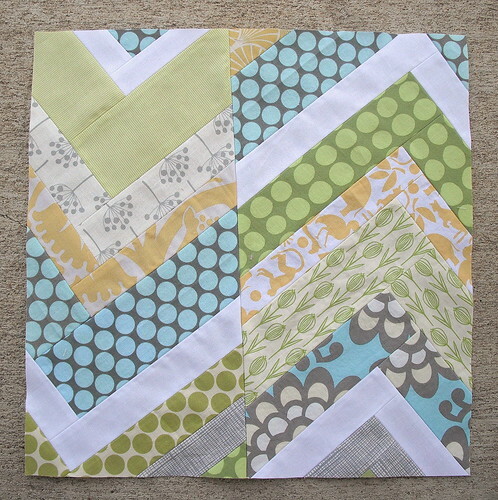 I happen to have plenty of scraps in these colors, so I didn't need to dig into my stash for these blocks. Woohoo! 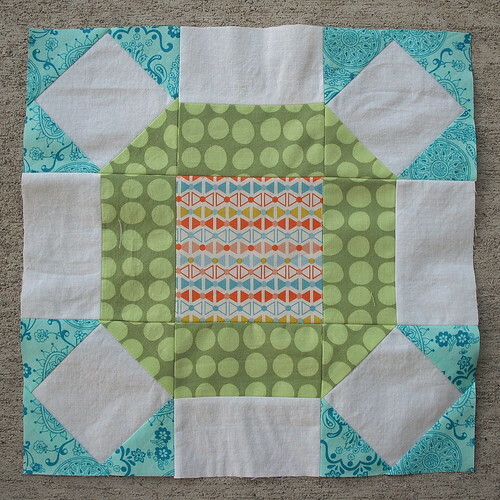 This first block ended up nothing like I originally planned, but in a good way! This was one of those times where I kept messing up the cutting and sewing and had to go to plan b, and then c, and then... well, you get the idea. It was an accident that the inner star is white instead of pink, but I think it looks pretty awesome anyway. 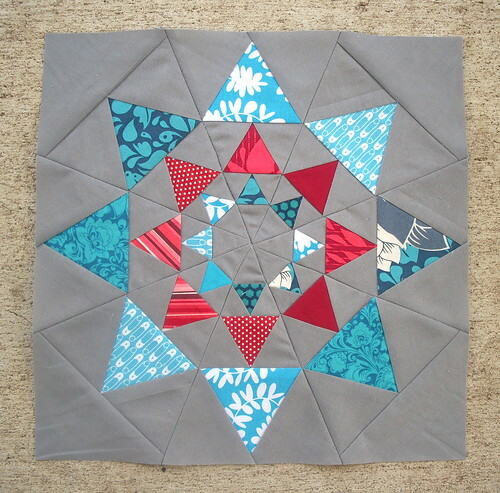 I wanted to do some interlocking stars like in this Sparkle Punch quilt, so my second block has three little scrappy interlocking stars. 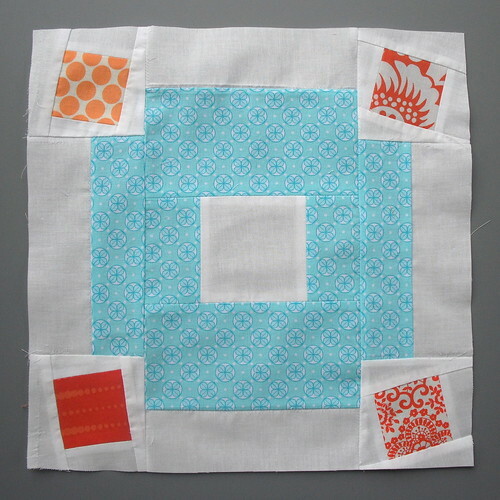 Check out the other blocks from the bee here!